I guess I started to notice it last year sometime. Some days it would feel strong and almost pull me – toward what, I didn’t know. Other days it would be more like a little nudge from the corner. I couldn’t put it into words, but I felt it almost every day, particularly around studio time. Something was shifting. My morning commute to the studio was a short one, about 20 feet or so. Coffee in hand I’d go out our french doors, past the creek and the pond and maybe gather a few fallen leaves from the garden along the way. My studio was a sweet little cottage with just enough room to make a good mess. It was picturesque, still, quiet, and private. I’d often look out at the lovely yard and the beautiful trees and marvel at how lucky I was. I was in a great home routine for 17 years; things were simple and calm; and my work was good. I was comfortable. Ya, I said it: COMFORTABLE. Hmm. So, when the universe (and a gorgeous and generous human named Donna) presented me with the opportunity to take a studio space in downtown Victoria, I jumped at it. I moved in March. This new space feels limitless and exciting. A bright spark has been lit in me and my work. I open the windows wide above the city street and am serenaded by the sounds of people laughing, cars honking, musicians playing, construction, alarms, bikes, skateboards, tourists, sirens – the sounds that have awakened that little part of my artist soul that was pulling and nudging me. Downtown can be loud. It’s always fluid. Every day I move, connect, explore, and watch. There’s a new energy flowing around me and it feels magical. While much has changed, much remains the same: my brushes, paints and canvases wait for me each morning; there’s always wine in the cabinet; strong coffee is never far; a decent playlist is constantly cranked; and things are still a little messy. One day I’ll return to my beautiful home studio, but for now I’m happy here – uncomfortable and thriving. 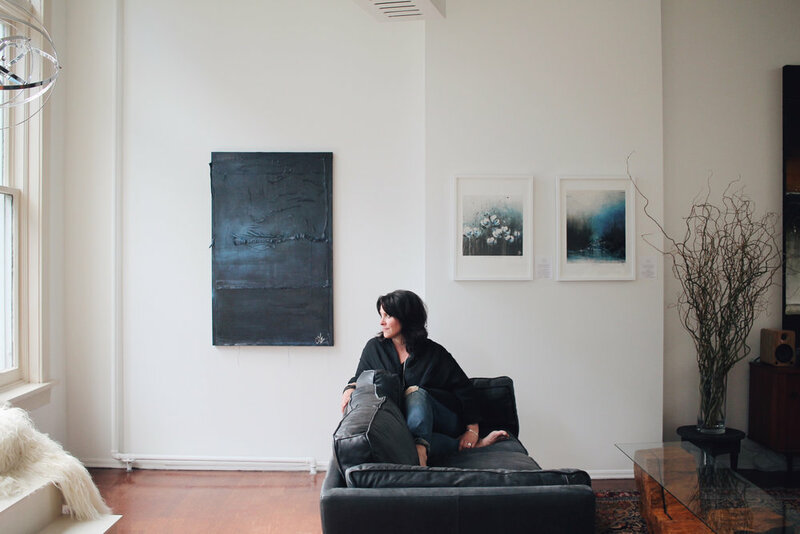 Laura’s studio is located on Yates Street in Victoria, BC, and is open by appointment only. “How can you possibly part with this one?” she asks. When I first started painting, I would get very attached to certain pieces. I’d hang them in my home and ponder them deeply. I’d stare at them, study them, try to remember each brush stroke and layer, and why I decided to leave ‘that’ there. Completely afraid that I wouldn’t be able to manifest something as wonderful ever again, I’d find myself trying to replicate the circumstances that yielded each most recent piece. I tried to remember what music I was listening to when I created it; which brushes I used; whether I was wearing my comfy pants. I’d compare each new work to the last one and critique it accordingly. I was no longer in the moment; joyful, in flow, creating, soaring, inventing, reveling in happenstance, making glorious mistakes. Instead, I was essentially stuck. I realized that I needed to LET GO. I needed to embrace the possibility that my best work is always yet to come. And, in order to continue to LOVE what I do, I must experiment and grow. I now paint for the sake of my creative mojo, my soul, my practice. By letting go of overthinking about the past, I am free to evolve… no strings attached. Last season, I began working on a new body of work. Although the pieces carry my recognizable textured style, they are quite different from anything else I’ve done before. They are contemporary, tone-on-tone and minimalist. Taking a leap in a new direction, no matter what your vocation or lifestyle, can be terrifying; but I needed to do it. In fact, I ached for it. The process of creating them was exhilarating, totally nerve-wracking and absolutely soul stirring. The final pieces hit the spot and I fell deeply in love with a few them… sigh. I’m honoured to say that my new work has been met with tremendous response and support. The 5ftx5ft blue piece (above) is entitled ‘Inside You’ll Find a Sigh’… a little nod to one of my heroes, Joni Mitchell, and a recognition of my heartfelt farewell as it makes its way to a new home. Now, let’s see what’s next. Six years ago, in honour of my 40th birthday, a large group of us rented a picturesque villa in the heart of Tuscany. Having believed I was Italian until I was in my teens (that’s a whole other blog) it made perfect sense for me to travel to ‘my homeland’ (delusion in full swing, but I’m ok with it). I imagined gathering with good people and sharing delicious food and wine under the proverbial Tuscan sun. Well, we did just that and more. It was one of the most amazing experiences of my life. La Poggiolaia is an elegant hilltop farmstead that is strategically positioned in the middle of Florence, Siena and Pisa. It takes its name from the vast groves of olive trees that surround it in every direction. Believe me, I could go on describing the sights, smells and swirling emotions; but let me just say, it’s heaven on earth. When I asked the owner of the villa for the name of a chef who could help us with my birthday dinner, Paola replied, “Judy can help you. She lives down the road.” What I came to understand is that when it comes to a deep, rich, culinary knowledge of Tuscany, no one knows more than Judy Witts-Francini. She is a legend in the making with her market tours and cooking classes bringing the very essence of Tuscan living to your core. She is a woman full of purpose and passion, and what she brought to our gathering was a deliciousness-defined that I savour to this day. This trip marked a shift in me. It was there, overlooking the golden hills that my private, deep-down voice said clearly, “Create what you ache for, Laura. It’s time.” I listened. Now as I sit looking at the shiny new 2016 calendar on my desk, I’m happy to report that my little voice has grown mighty strong and guides me daily. She’s the director of many exciting events this year, one of which is a return to that magical property – this time with my paints and brushes. We’re offering our Beautifully Imperfect Painting Retreat in that magical place. Paola is there ensuring our beds are feathered, and my good friend Judy will be waiting to teach us the secrets of Tuscan cooking and charm us with her local magic. To mark this New Year and the awesomeness that it holds, I’ve asked Judy to share one of her delicious recipes. I hope you enjoy it. For information on all our retreats, visit my website or email me at lharris@islandnet.com Tuscany, please book before Jan 22, 2016. I’m sorry I haven’t written for a while. It is my intention to change that. Lofty goals are in place, just you wait. The dust has settled into the corners of our new home and my studio feels like I’ve been there for years. New images are taking shape on the canvas, a delightful side effect of a change of scene. These summer days have a comfortable, easy flow to them and I’m strangely tempted to stay put all season. But life is too short and delicious for that. I’m writing this from a cozy little spot in London. Oh how I love this city... the smells, the light, the sound of the tube as it wanders the city with the bustle of wickedly interesting, stylized humans of every shape and colour. I'm always overwhelmed and crazy-inspired by the innovators and creators who have shaped this iconic place over the centuries, the real-deal-original “storytellers and makers”. As I navigate the cobblestone, a little voice whispers "the Masters walked here, can you feel it?". I try to soak up just a smidge of that juicy mojo and tuck it away to use when I get back to the studio. I have stood gobsmacked and teary in front of paintings that shaped who I am as an artist. I’ve stared at the actual brushstrokes of Van Gogh and Rothko’s edges and thought “My God, I can almost feel them.” Tate Modern, Saatchi, The National Gallery, Portrait Gallery. The mere thought triggers a deep sigh. And the pubs, Lordy, the pubs! Epicenters of connection and daily celebration, they define and honour community in a way that is sadly lacking at home. The first photo above was taken while sitting at one of my favourites. For me, travelling rekindles a romance with self. It reminds me what I’m made of, who I am. It fuels my creative soul, reminds me that I’m human, I’m brave and I’m free. It makes me believe, once again, that anything is possible. Notting Hill is the current home of two dear friends of mine, who continue to amaze me with their generosity of spirit and courageously big living. We will walk, shop, dine and laugh our asses off before heading to Lisbon tomorrow. Mind the gap. One year ago I was completely dedicated to a plan… I would happily continue on, in my cozy home with my daughter, content with my tiny studio and I’d walk each morning on the paths by the coast, as I’ve been doing for 14 years. I’d be happy, strong, brave, free and fulfilled, and damn it, I’d do it on my own. Since then, I’ve learned that sometimes a detour offers a much sweeter journey. I’ve learned to always leave room in the plan for a little magic. Once again I learned to trust the unknown, for it knows better; that the truest courage and bravery is wrapped in a wide-open heart, and that fear is dangerous. I’ve learned that real freedom exists in the confines of unconditional love and that what I always thought was possible, is. Severe tendonitis, taught me to LET GO and for God’s sake appreciate what I do for a living… HONOUR it. I discovered that there’s wild strength in asking for help and that I have some Super Heroes waiting for the call. I learned that adapting is much cooler than controlling, and I’m now certain that ‘messy’ is my style and that beauty lives there. I learned that a good cry is as good as a laugh; joy is severely underrated; creativity is divine; red wine helps; and that dogs are highly evolved. I learned that everything is going to be ok; that time is precious; that we all have to dream bigger, give more and love harder. I realized that my daughter’s wisdom is super natural; my Mom’s touch is in everything I do; and my Dad will always, always show up just when I need him. I learned that friends stay and friends go, and that all of them leave a beauty mark. I was reminded to say Thank You and mean it. I learned that a full dinner table is sacred and that there is nothing sweeter in the world than the sound of laughter in our home. And this year I learned that the unplanned route may lead you to a place more magnificent than you’ve imagined. In our painting workshops I suggest that we be present in the moment, let go, find joy, trust the process, and that our mistakes are gold. Perhaps tuck a few of those gems in your pocket and carry them through your days… I’m going to. Bring it on 2015! From here in our new home with my new studio lit up in the distance, I wish you a joy-filled, new year full of glorious mistakes and unexpected detours. I’m off for a walk on my new favourite path by the sea. I’m in the process of moving and I spent most of last week in the basement with one of my oldest and dearest friends, surrounded by cardboard boxes and tape. What to keep and what to toss was the theme. I uncovered all sorts of treasures and made some difficult decisions. As I sifted through old family photos, high school love letters and sweet-smelling baby clothes, I was reminded of who I am, where I came from, what I’ve been through and how and why I love. What a gift. In one corner of the basement was a stack of paintings I haven’t looked at in years. This is one of them and I’m thrilled to have it. I can see my sense of play, my joy… my wildly unapologetic approach to the process. The evolution in my work fascinates me. Perhaps I’ll revisit this style again soon.